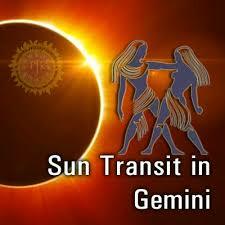 Sun will go in Gemini sign on 15th June morning. The condition of Sun is considered best in this sign. Venus is also with Sun. There is direct vision of Shani on them. Sun is planet of fire. Venus is planet of water and Shani is planet of air. The relation of the planets of opposite nature will create bizarre results. Aries: Take care of health. Do not create problem in relations due to anger. Take care in journeys. Donate jaggery and wheat on Sunday. Taurus: Avoid eyes and bone problem. Do not neglect medicines. There might be change in employment. It is beneficial to do fast on Sunday. Gemini: There will be success in career. Take care in marital life and children. Chant Sun psalm on every morning. Cancer: There will be change in career. Take care of your health. Relation with father might get disturb. Keep fast on Sunday and wear copper. Leo: There might be financial benefits. You may get fame and respect. Take care of your child. Chant Gayatri psalm every day. Virgo: There will be relocation in employment. The expense will increase. Take care of life partner’s health. Do not get anger. Offer water to Sun. Libra: Take care of your relations. Take care in journeys. There might be stomach and urine problem. Chant Sun’s “Om Hraam Hreem Hraum Sah Suryay Namah” psalm. Scorpio: Avoid accidents. There might be problem in career. Control your anger and speech. Offer water mixing turmeric to Sun. Sagittarius: Take care of your life partner’s health. There might be financial losses. The relation with superior may get disturb. Chant Hanuman Chalisa and give respect to father. Capricorn: Avoid loss in job and business. There might be sudden accident. Take care in writing and documents. Aquarius: There might be problem in decision. Pregnant women should take care. Do worship. Pisces: Take care of health and avoid stress. There might be change in job. You might face bone problem. Good Luck: Do not wear Gomed with Ruby. Otherwise, this might create defamation and eye disease.